This is the same 100% grass-fed beef liverwurst but these are the end pieces. End pieces are cut off the end of the roll before packaging. These make great snack packs because they're already cut into small portions. Each package contains between 2 - 6 end pieces in various sizes. Put these in your cooler for road trips and they'll be thawed and ready to snack on when the kids say, "I'm hungry!". US Wellness Meats’ Beef Liverwurst is a mixture of grass-fed beef trim, liver, heart, and kidney. It is the boldest, and most popular organ sausage US Wellness Meats offers and is a tasty way to incorporate healthy grass-fed beef organs into your diet. Each Beef Liverwurst End Pieces package weighs approximately 1 pound. Delicious ! 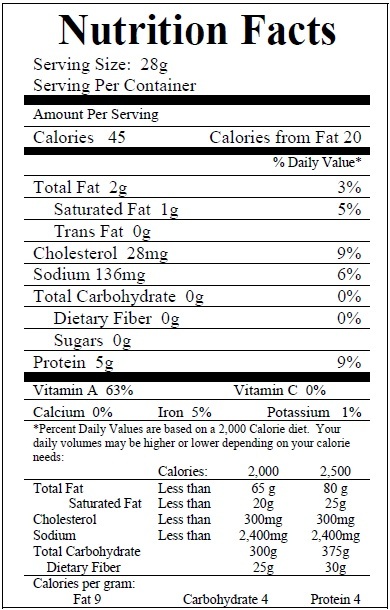 But nutritional info is bizarre. According to your website, 28 grams is the serving size. That means there are 16 (very thin) servings in a pound. Since these are end pieces of liverswurst, why not list nutritional info per piece? Love this liverwurst. So delicious.